Earlier this month my daughter Evie and I went to Disneyland for her third birthday. 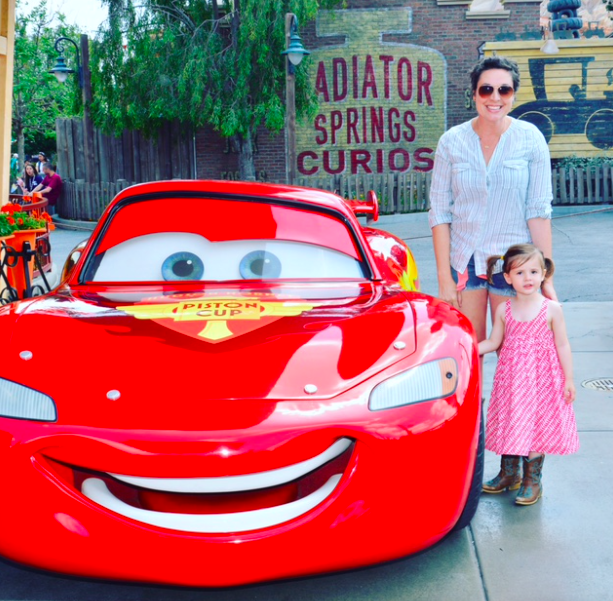 Among the characters she met: Lightning McQueen, Mater, Mickey Mouse, Buzz Lightyear, Woody. Not a princess among them. I don’t have anything against girls who like princesses. I love the Little Mermaid and Frozen, personally. But Evie is more into Thomas the Tank Engine. The upside of her third birthday was a trip to Disneyland. The downside? We are not putting off potty training any longer. And I’ve been unable to find any underwear for her with any of her favorite characters on them. Oh yes, there’s now a line of Superhero underwear for girls. But it’s Batgirl, Supergirl, and Wonder Woman. That’s not the same, as Evie will make clear to you. Even the Mickey Mouse Clubhouse roster separates along gender lines: Minnie and Daisy only for girls. I’m not convinced Evie fits into a bucket as extreme as “tomboy.” She also likes wearing skirts and dresses and loves to be a mother to her stuffed animals. Likewise my son, Eli, loves to skip down the street singing Taylor Swift and wearing a Snow White dress. But he’s wearing camo pants and Spiderman shoes with it. Neither of them fit into an easy “gender” bucket. Why do they have to? This wasn’t a problem when they were babies for a simple reason: For a lot of the time they were Honest customers. Honest pioneered cool patterns that could go with either gender or be totally gender neutral like giraffes, skulls and crossbones, dinosaurs, comic book patterns, construction tools against a peachy background, and fun plaids. On forum after forum people have noted this underwear thing is clearly a business opportunity. It can't simply be sexism right? A plot to train women into thinking the highest ideal is to be rescued by a prince? Maybe the big guys don’t think there’s enough scale to justify paying character royalties to put Spiderman on girls underwear. And maybe it’s not a big enough opportunity to create a whole company around. But it strikes me that there are a host of companies-- like Honest, like H&M, like Tea Collection-- that are redefining kids’ clothes with bolder, hipper patterns, colors, and styling combinations that could easily tap into a lucrative niche here. And, yunno, send a message to young girls that they don’t have to wait for a prince to rescue them.